gives a graph with vertices elem1,elem2,… and edges connecting each elemi to its nearest neighbors. gives a graph connecting each elemi to its k nearest neighbors. gives a graph connecting each elemi to at most k nearest vertices within radius r of elemi. 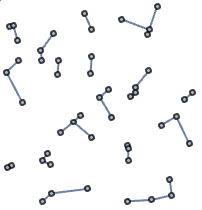 gives a graph connecting each elemi to all vertices within radius r of elemi. The nearest neighbor graph is also known as k-nearest neighbor graph (k-NNG). An element elemj is a nearest neighbor of an element elemi whenever the distance from elemi to elemj is no larger than the distance from elemi to any other element. An element elemj is a k-nearest neighbor of an element elemi whenever the distance from elemi to elemj is among the k smallest distances from elemi to any other element. NearestNeighborGraph works for a variety of data, including numerical, geospatial, textual, and visual. NearestNeighborGraph takes the same DistanceFunction as Nearest.